The mainstream media would have you believe that those who support Jeremy Corbyn are a niche group of baked bean obsessives all loudly farting in the same echo chamber, ranking brands of quinoa and complimenting each other on the potency of that last guff. Purple-haired acolytes who – oblivious to political reality – pathetically reinforce each other’s beliefs about their hallowed leader. Whose omnipresent hipster heavies deny him opportunities to speak to the BBC and its ilk. In case he says something unfashionable or misconstruable about his plan for ending poverty or how he quite likes humans and peace. Corbyn’s decision to engage with the public through social media, rather than utilise the services of traditional outlets, arose as a result of the shameless bias exhibited during an interview with him conducted by BBC Political Editor Laura Kuenssberg. Therefore, rather than the social media approach being a visionary masterstroke that embraced the changing times, it was a necessity borne of refusing to have his voice bastardised by any Establishment agenda. Still, the circumstances have proven serendipitous in their success. The rapid onset of obsoletion faced by traditional media outlets is causing them to writhe. They are death throes. Death throes in which they squeal with faux-righteousness about truth being a casualty of postmodern media practices. Squeals in the realisation of their losing control. Squeals that lament how the truth is not theirs to narrate anymore. 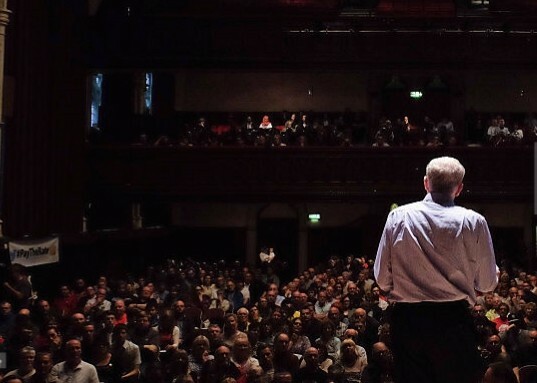 If it opts to report on such events at all, the mainstream media unashamedly divides the number of people in attendance at Corbyn rallies in two. They divide because they are terrified. But Jeremy is the very antithesis of this. He appeals to the human virtues of togetherness and optimism. It’s poignant that it was the city of Liverpool in which the first major sign that Corbyn’s stealth tactic in galvanising support was proving successful. On a rainy Monday evening, the red half of Liverpool joined the blue half, forming a crowd of over ten thousand people gathered solely to hear Corbyn speak. The poignancy in it being Liverpool that welcomed Corbyn so rapturously, is in its people’s appreciation and celebration of the power of a totemic figure. With Liverpudlians able to claim perhaps the most famous pacifist to have ever lived as one of their own. As a means to keep the impoverished north sweet, George Osborne liked to intermittently dangle the fantasy carrot he called the Northern Powerhouse. Well. The north has a bona fide powerhouse now. One powered by the people who have been fobbed off for far too long. The success of the Liverpool rally built on the achievements of his subsequent rallies in Yorkshire, also attended by thousands of members of the public. Corbyn has momentum in the north. In the wake of the referendum shockwave, UKIP support is dwindling. Change was demanded. Change was essential. Now, those that were hoodwinked by pledges of liberty and autonomy have watched the self-serving, careerist cowards that made such promises flee for cover. They see Corbyn behaving in the opposite manner – resolutely refusing to abandon the responsibility he willingly accepted at the behest of an unprecedented number of people, who elected him to be leader of their party. People are opting for hope. The ongoing leadership contest is an unabashed dismissal of the desires of Labour party members. The dogged, spiteful manner in which the contest was ruthlessly battered into existence was a disturbing demonstration of the abject disregard the Parliamentary Labour Party has for the principles that are meant to constitute its very own soul. Owen Smith was selected from the somewhat-limited pool of the right wing of the party that didn’t vote in favour of engaging in an illegal war. Smith began his leadership campaign under a pro-austerity banner, before – in a cynical attempt to win over voters – rapidly flipflopping and adopting Jeremy Corbyn’s policies as his own. Betraying, as he did so, an astonishing lack of nous concerning his capacity to understand how Corbyn’s unwavering adherence to sound moral principles contributes a great deal to his popularity. Furthermore, Smith then attempted to present himself as ‘the reasonable bloke’, by offering to find a place for Corbyn in any Labour party led by him. Presumably in the hope that Corbyn could be bought. A condescending deception tantamount to stabbing someone in the back before pseudo-sympathetically mopping up the blood afterwards. At least Angela Eagle did the right thing by Smith and the right wing of the party. What with her effortlessly forgetting her principles in exchange for a promised position in any Smith shadow cabinet. Such servility and decency as she acquiesced to her warmongering overlords. The irony in the Parliamentary Labour Party’s vendetta against Corbyn and its anger at his refusal to surrender his leadership, is that it is they themselves inflicting the harm. And should they achieve their aim of unseating Corbyn, they will be spontaneously bereft of hundreds of thousands of members. 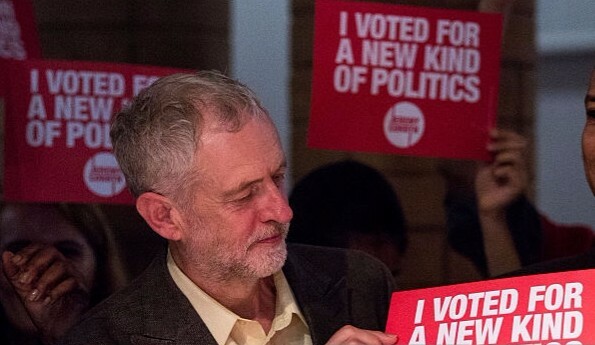 People who joined the party specifically because they were inspired to do so due to Jeremy Corbyn being its leader. These people, as well as countless others who would have been willing to campaign for them in the likely snap election this approaching autumn. Yet, rather than endorse Corbyn and acknowledge the phenomenal public support he has garnered, the PLP is preferring to risk martyring Jeremy Corbyn and simultaneously annihilate itself. The primary criticism levelled at Corbyn by the right wing of his party is that he lacks natural leadership skills. And if one’s definition of leadership values authoritative oratory as the exclusive attribute (although one would hope lessons might have been learned around that), then that point is a valid one. Yet, an inability to appreciate a leadership quality such as the requisite levels of stoicism Corbyn has needed to muster in order to withstand the relentless, ad hominem attacks he has been subjected to, seems superficial, at best. Some lead by barking orders, others by example. The concerns over how vocally articulate the figurehead of this soul-redeemed interpretation of the Labour party are largely irrelevant, regardless. This exponential uprising of politically-stoked people is a far more profound occurrence than the capricious popularity of any individual. We are the leaders. Each and every one of us. That’s social democracy. The neoliberalists that dictated the political climate of the last generation were spectacular in their successful deception that convinced their workers of the efficacy of ‘trickle down’ economics, and in their promulgation of the idea that they had a democratic choice. Binary-mindedness plays directly into the hands of those that seek to divide and conquer. The right wing of the Labour party recalls its wangling of power through prostituting its soul as an accomplishment. Establishment stooges whose every word reeks of arrogance and a stench of entitlement. One echo chamber I never wish to enter.